← Let it snow, let it snow, let it snow…. Gumby is still trying to hatch her jellybean. 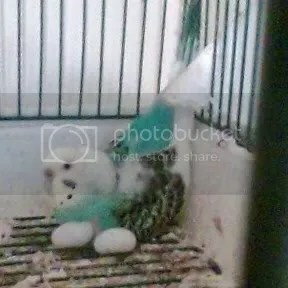 I wrote recently about my two parakeets, brother and sister, who want to start a family. I said how I had to take the eggs away and gave her white jellybeans, instead. I’ve done this before with other related parakeets. Eventually, they figure the “egg” isn’t going to hatch, and they go on to different activities. But, Gumby and Beady, her mate, have not given up on this jellybean. It is so sweet, but sad, too. The only other thing to do is keep them apart, and that would be cruel, too. Parakeets mate for life, and Beady has already out-lived two long-time mates. Beady is my oldest baby who was born here, and he is the cutest, too. I have a soft place in my heart for him, and all the grown up babies, and want them to be happy.